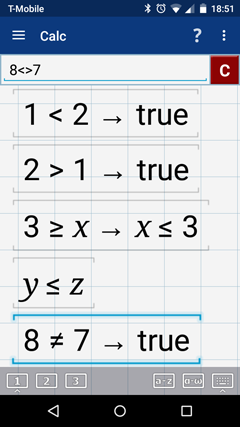 Inequalities are mathematical statements that compare two quantities using the symbols: >, <, > , < or ≠. In the app, they are listed as functions of the parentheses keys. To use >, type in >= (tap the parentheses key three times for >). For example, to say "5 is greater than 4," you would type in "5 > 4." To say "4 is less than or equal to 5," you would type in "4 <= 5." To use the ≠ symbol, enter <>. For "4 is not equal to 5," type in "4 <> 5." All three of the above statements would be "true." The app will also tell you whether the statement is true or false.